Everlast Waterproofing are pleased to announce that the project works on this live engineering workshop have now been completed. · The works were carried out on a live engineering workshop which operated 24 hours a day. The works were carried out without effecting the clients operations. · The roof was an existing asbestos sheeted roof, dual pitched with Filon rooflights. The roof area was 2200m2. · We over sheeted the whole roof using an Ashgrid Bar & Support System, quilt insulation and TATA Composite Panels to achieve TATA’s Platinum Warranty. · We installed a new central walkway gutter, enlarging the existing asbestos one, by installing a galvanised carrier tray and lining with Resitrix waterproof membrane. 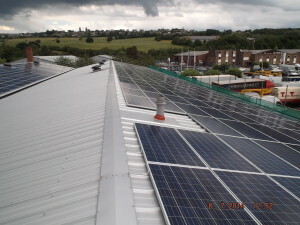 · Following completion of the works a PV System was installed on the 2 South facing pitches of the roof.